Federico Garcia Lorca achieved lasting fame with his poetry in the 1920s and ’30s -- first in Spain and then internationally -- but he was also a popular playwright, with major productions in Madrid. Inverted Alba (A Fable and Roundelay After Images by Garcia Lorca), currently at Dell'Arte, uses elements of four Lorca plays and his poems (as well as poetry by Pablo Neruda, who addressed Lorca in several poems). Joan Schirle returns to the Carlo Theatre stage in this work, which she created with director Ronlin Foreman and fellow cast members Laura Munoz and Richard Newman. It begins with balletic movement by the cast in flowing capes, as they speak the poetry, singly and in choral singing. (Ronlin Foreman's twin Donlin contributed choreography.) This is echoed later in recitation accompanied by actors unfolding strips of billowing silk, to me the evening's most moving combination of words and images. Also from the beginning there is a recorded soundtrack of ambient sounds and music (particularly some choice cello) that may relate to the action of that moment, or foreshadow or echo themes. But soon Joan Schirle is commanding the stage in a comic portrayal of a tight-fisted impresario dominating her two actors, who are lovers imprisoned on the stage but planning their escape. 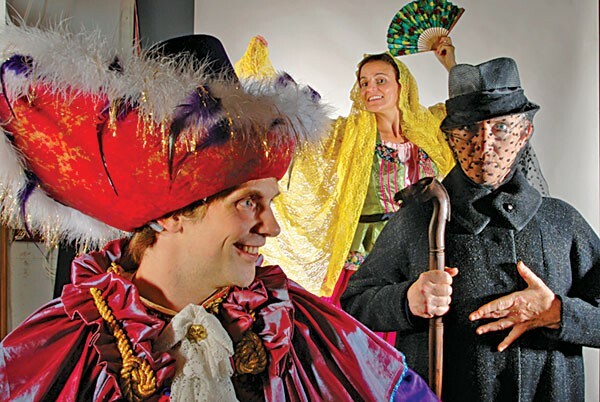 With rapid-fire accents, quick characterizations and hilarious yet sinister panache, Schirle also becomes the star of the show they're presenting, a familiar commedia about a slovenly rich man forcing himself on a maiden who wants to marry her young lover. The producer she's been playing believes this is the kind of entertainment the public wants, but the rest of the evening will break lose from that mutual imprisonment. Unless I'm mistaken, the main texts for this early section are Lorca's two Punch and Judy-style puppet plays and an unfinished experimental script set on a theatre stage. The "Roundelay" element -- a repeated refrain -- might be the opening lines of the Lorca poem "Gacela of the Dark Death": "I want to sleep the sleep of the apples ..."
But the last section is certainly based on one of Lorca's best-known plays, The House of Bernarda Alba, which continues the theme of lovers being separated by dominant authority, in this case an iron-willed mother and the implacable traditions of Spanish honor. She imprisons her two daughters in the house for the prescribed eight years of mourning, with an insistent lover outside. The mood is a good deal more serious, conjoining Lorca's obsessive themes of love and death. Lorca told this story in a three-act play, so it can only be outlined and illuminated by lightning flashes of images in this relatively brief section. Though evocative and even brilliant -- such as the part of the tale that's told by a dog -- I found the story hard to follow, particularly who's who. Richard Newman (with his expressive face and stage presence) and Laura Muñoz (with her poised and eloquent movements, and whose Spanish adds dimensions) are always excellent and watchable, but they play so many roles it's sometimes difficult to tell which character is talking, or who they're talking about. Along with Tim Gray's sound design and music, Michael Foster's lighting and Lydia Foreman's costumes, Ronlin Foreman's scenic design economically creates Lorca-like moods -- the shuttered darkness of that house spoke volumes. But the lack of detailed social context and individuality in the characters from the longer play has its costs, as a stylized death lacks climactic impact. Each element of this production is excellent, and together they create atmospheres to fascinate and intrigue the audience. Fans of Schirle will want to see this, both for the skills and talents they know and the new places her explorations take her. So to honor this experimental spirit, here's how Garcia Lorca concluded a speech after one of his plays: "I know that those people who say, 'Now, now, now' with their eyes fixed on the small jaws of the box office are not right, but those who say 'Tomorrow, tomorrow, tomorrow,' and feel the approach of the new life which is hovering over the world." Inverted Alba continues Fridays through Sundays at 8 in the Carlo until Oct. 25. Ferndale Rep opened Crimes of the Heart by Beth Henley last weekend, directed by Ginger Gene. It can be seen Fridays and Saturdays at 8 p.m. and Sundays at 2 for two more weekends, also ending Oct. 25. There have been several weekends of multiple openings lately, with long stretches of no openings at all. How theatres schedule productions is their business, but when several shows open on the same weekend, I can't review all of them in the next issue. I try to anticipate by previewing in this limited space, but I want theatres and readers to know that not all reviews are going to appear as early in a play's run as all of us would like. Assuming I'm not on a sequestered jury, I hope to write about Crimes of the Heart next issue. In two weeks, Oct. 22, HSU opens its semi-annual musical, City of Angels in the Van Duzer Theatre for a two-weekend run.